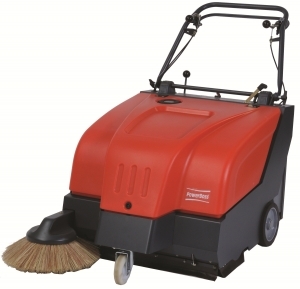 We service all makes and models of industrial floor sweepers and scrubbers. We specialize in PowerBoss equipment. PowerBoss has been manufacturing a full line of rugged industrial cleaning equipment in Aberdeen, North Carolina since 1985. Our technicians are factory trained at the PowerBoss school. Call us today to buy, lease, fix, or refurbish your industrial floor sweepers and scrubbers. Learn about PowerBoss and their industrial sweepers and scrubbers manufactured right here in the USA. Upgraded components like emission compliant engines are integrated into the design. The PowerBoss Nautilus is a maneuverable mid-size scrubber sweeper with large capacities and long run time. Heavy Duty stainless steel parts with exceptional cleaning performance.